"Past Our Primetime" had taken the Flag Football championship for the second straight season, making them back-to-back champs! 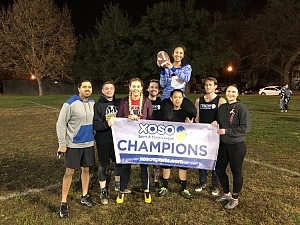 Entering the title game "Past Our Primetime" was definitely the odds on favorite, but an early season loss to their championship opponent "Team B" meant they couldn't let their guard down. That they didn't, instead taking care of business by defeating "Team B" 26-12 thanks to an impressive all-around effort. "Team B" put up quite the fight, but it just wasn't enough to overcome this juggernaut. Overall "Past Our Primetime" finishes with a 6-1 record, with their lone loss coming to "Team B" in week 1. After that they were nearly unstoppable. That includes their mind-boggling +101 point differential, surpassing even some of our greatest teams. Congratulations to "Past Our Primetime" on the incredible season! We hope they enjoy the short break and we'll see them again next spring!